One of the most difficult things for all of us to overcome in any competitive situation is self-serving bias. The below video explains it in an intuitive and entertaining way. How many sports fans can be counted on to objectively view the decisions of referees? Not many. And similarly, how can we expect members of a group to objectively judge the fairness of actions of other group members? Even those of us who take great pains to see the viewpoints of the other side are likely influenced by unconscious bias in service of our self-interest. These same processes explain how both Jews and Palestinians have divergent historical narratives that they are completely convinced is the only view, how fiscal liberals and conservatives have completely opposite ideas about economic history, and how sports fans can be so convinced that they are routinely robbed by referees. Opposing groups are often going to see facts in a way that conforms to their moral worldview (see research on and examples of moral coherence). Self-serving bias may be ubiquitous, but there are still situations and circumstances that may reduce or exacerbate these tendencies. Recently, at the 2014 conference for the Society for Personality and Social Psychology, I met Konrad Bocian who is investigating liking as a potential boundary condition. Specifically (as is described in the below video), self-serving bias may occur only when it is done by people one has greater liking for. In three studies, Bocian and Wojciszke measured moral judgments of rule-breaking behavior that benefited the judging party, and observed that feelings toward the perpetrator of the behavior were central to these moral judgments, even when the behaviors benefited the judging party. This work relates to the Asteroids Club paradigm that is being pioneered by The Village Square, in that a central aspect of such meetings is to reduce the disparity in liking between members of one’s own group and members of opposing groups. This hypothesis should be tested directly, but perhaps in moderating our feelings toward both our own groups and competing groups, we can mitigate some of the self-interest bias that exists in all conflicts and learn to disagree more productively. ps. Read more at Konrad’s website or read the published paper here. One of the more robust findings in social psychology is the idea that common goals reduce inter-group conflicts. Several groups have recently taken this finding into the field, using Jonathan Haidt’s Asteroids Club model, including a dinner we co-hosted with the Nathan Cummings Foundation. The group that has done the most with this concept is undoubtedly the Village Square, an organization that has put together a series of dinners where liberals learn about conservative concerns, and conservatives learn about liberal concerns, with the idea that people can come together, over food, to learn about issues that everyone should be concerned about. Liberals are generally good people. The decline of individual moral behavior is a serious issue that we should work together to correct. The moral corruption of our political process through the influence of money is a serious issue that we should work together to correct. The first thing we learned is that it is really hard to get people to answer survey questions with no payoff or incentive, and so only 10% of the approximately 150 people who attended completed the surveys. As a result, the differences below are not statistically significant and consumers of traditional statistics would say that there is no difference. A Bayesian approach (that I subscribe to) would say that this is relatively weak evidence. With that caveat in mind, below are the survey results. 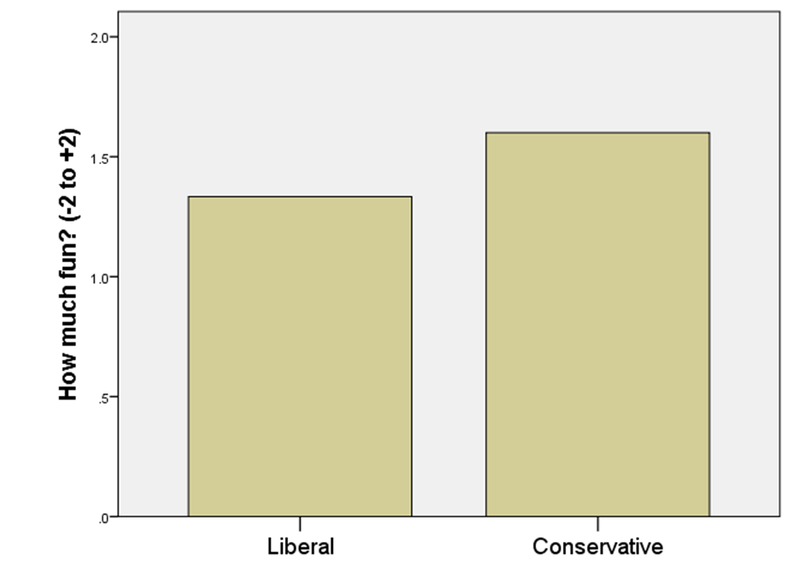 It appears there were slight benefits as to how liberals and conservatives were perceived by the audience, with both groups being perceived as slightly more good. However, the most important result is the last 2 bars, where, even in a case where participants already perceived the dual “asteroids” as serious, the event appears to have spurred some participants to take these threats even more seriously. Research would indicate that forging a common bond should indeed lead to the possibility of greater inter-group cooperation. That being said, this is indeed weak statistical evidence, given the small sample size and should be contextualized within the results of other Asteroid’s Club results. Hopefully going forward, we’ll start to see a consistent pattern amongst events, such that sum of such weak evidence, combined with the results of lab studies, tells a consistent story. If your organization is doing conflict resolution work (any conflict between groups will do, not just in the realm of politics) and would like to be part of that story, please do contact us and we would be happy to setup a similar survey for your event, to see if it does indeed bring people together, as well as to contribute ideas from our research. The Asteroids Club is any group of people with diverging political views who gather not to debate, but to listen to the other side explain why it is concerned about certain threats. The metaphor is meant to capture the fact that there are many threats coming at the United States–like asteroids scheduled for direct hits—yet each side of the political spectrum focuses on a few of them and ignores or discounts the asteroids that most worry the other side. As John Stuart Mill said in 1840: “in almost every one of the leading controversies… both sides were in the right in what they affirmed, though in the wrong in what they denied.” The Asteroids Club is a novel format for bringing people together, over a meal, for a discussion in which each side helps the other to see more clearly. The format has been developed by The Village Square, in Tallahassee Florida. The Nathan Cummings Foundation hosted the first New York City Asteroids Club dinner on February 26, 2014, in the home of its president, Simon Greer. The foundation is in the process of updating its research and funding portfolios, and its leaders were interested in learning more about the issues of income inequality and the causes of poverty. They were also interested in developing relationships with experts from diverse perspectives who could help them understand these complex topics. Simon and I therefore chose the two asteroids of rising income inequality (a topic of greater concern on the left), and declining rates of marriage and family stability (a topic of greater concern on the right). This report is intended to be useful for anyone interested in hosting future dinners, or in bridging the political divide more generally. However, we note that we decided to invite experts from right and left to the first dinner, rather than ordinary people, to maximize the degree to which we could learn about the best thinking and research on these topics. This dinner may therefore not be representative of what will happen if the Asteroids Club format is rolled out and used widely by civic groups across the nation. We ran the dinner using the Chatham House rule, which says that participants are free to write about the event, but cannot reveal the identities or affiliations of the speakers. So we will simply say that we invited two very prominent and well-respected journalists, one clearly identified with liberalism, one with conservatism. We asked these two co-hosts to suggest additional people they wanted on their “team.” (We had hoped to avoid the terms “team” or “side,” but it was hard to do so.) These two co-hosts then nominated several other experts, and took a few suggestions from Simon and me about experts we know on both sides. All 10 people who were invited accepted the invitation. The final dinner was attended by 18 people: 6 liberals, 6 conservatives, Simon and me (who served as co-hosts), and four observers affiliated with the foundation. The expertise in the room was extraordinary, including journalists, economists, activists, and people with experience in government and policy-making. Two weeks before the dinner, we assembled a list of readings nominated by the participants and posted them all in a google document that we used to share information and coordinate the evening. Because these prominent participants were all extremely busy, we did not push for them to do much preparation beforehand, although we did encourage them to read one or two articles from the other side, and to watch my TED talk that introduced the idea of the asteroids club. The evening began at 7:30 with drinks, hors d’oeuvres, and unstructured socializing, which was quite cross-partisan. At 8:00 the two teams convened separately to go over final plans for their presentation. (In retrospect we should have encouraged the two teams to do more of this online, before arriving at the dinner). Around 8:30 everyone moved into the dining room and sat in seats that had been assigned to ensure a good mix of people at each of the two long tables. Simon welcomed everyone to his home and presented the Hebrew conception of two kinds of argument: machloket l’shem shamayim – argument that is for the sake of heaven which is intended to better discern truth and move the world forward, and 2) machloket she’lo l’shem shamayim – an argument that is not for the sake of heaven, but is just for the sake of itself or for the sake of being controversial. Argument in pursuit of truth is considered sacred in the Jewish tradition. –15 minutes to describe the threat; why this matters, why it’s urgent….During this time, the listening side gets to ask a few brief elaborative questions, but hold argumentative questions for the next step. –5 minutes for “telescope” time — conservatives ask critical questions, request more info, challenge assumptions. –15 minutes to describe the threat; why this matters, why it’s urgent…. During this time, the listening side gets to ask a few brief elaborative questions, but hold argumentative questions for the next step. –5 minutes for “telescope” time — liberals ask critical questions, request more info, challenge assumptions. 9:45 Integrative discussion, 20 min. 10:05 Concluding discussion and resolutions. 10:30: End of formal discussion, take closing survey. The schedule we actually followed was close to this, but because we were running behind and because there was clearly a surprising amount of agreement on what aspects of poverty were of great concern, I decided to merge the two parts of the integrative discussion into a single discussion of what really matters – what issues either side had raised that seemed to elicit at least some assent from the other side. Waste: the financial squeeze and inefficiency caused by “arms races” as people spend more money to attain “positional goods” such as a home in a good school district. Lack of opportunity for large segments of society; The waste of human potential among the poor. Separateness – having communities that are cut off from the mainstream of society; having low social trust and cohesion. In general there WAS bipartisan agreement that marriage rates and family stability have declined in recent decades. There WAS bipartisan agreement that these trends are bad for society, and that it would be good if we could find ways of reversing the trends. There was a very high degree of bipartisan concern about poverty, especially for its pernicious effects on children. There was also a consensus that the people who suffer most from these trends are single mothers (who bear the main costs and stresses of raising children under often adverse circumstances) and their sons. Daughters suffer too, of course, but there was consensus that boys’ outcomes are more adversely affected by the absence of a father, and these adverse outcomes then set up a feedback loop for the next generation in which there are way too few stable, employed, and marriageable young men who could break the cycle of father-absence. We are working with my colleagues at CivilPolitics.org to develop assessment tools that can be used by any organization running any kind of civility-enhancing event. For future events, we will send all participants a link to a web-based survey a few days before the event, then pass out a paper questionnaire at the conclusion of the event, then send out a web-based followup survey a week after the event, to assess the effects of the event on attitudes about the asteroids, and about the people on the other side. For this first dinner, with 12 super-busy people, we only obtained four responses to the first web survey. (You can see that first survey here. Future versions will be much more extensive.) We therefore decided to focus our efforts on obtaining measures of the key variables at the conclusion of the evening. Did people come to see the asteroid presented by the other side as a clearer or more pressing threat than they had before the dinner? That is the central goal of an Asteroids Club dinner. How has tonight’s discussion influenced your beliefs about the severity of the problem of income inequality for the USA? What can we make of this pattern? It appears that the asteroids club format worked for the family decline asteroid. The conservatives presented the asteroid, the liberals listened, and then came to see it as a greater threat. This is very encouraging. But it is harder to know how to interpret the results on the inequality asteroid. 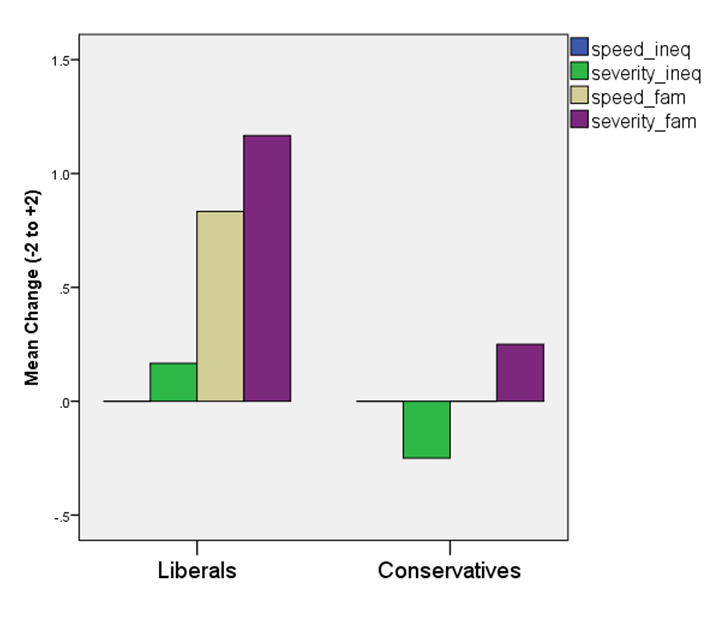 The lack of movement could have resulted because A) the liberal team made a weaker case about inequality than the conservatives had for family decline, or B) the conservatives were less open-minded and willing to listen, or C) the facts about inequality and its harms are truly more ambiguous and contestable than they are for the family decline asteroid. My conclusion from the background reading, and from the conversation during the dinner, is that C is true and is at least part of the explanation. 1) The format is enjoyable and promotes civil interaction. Sharing a meal in a private home seems to have made people particularly polite and open. 2) It is difficult to do two asteroids in a single 2 hour discussion. There are advantages to doing two – it led to a sense of balance and fairness. But at least 3 hours of discussion would have been needed to cover both. 3) Relationships matter, and it takes time to get to know each other and develop trust. Ideally, asteroids clubs will be true clubs, with a stable membership that meets every month or two. 4) The exact instructions for each part of the evening matter. More work is needed, drawing from experts in negotiation and facilitated discussion, on how to optimize the integrative discussion and conclusion. 5) More “warmup” exercises could be tried. We kept this evening fairly direct and cerebral – focused on the ideas and research. But future events could begin with more activities to build trust and cohesion, such as singing the National Anthem, or doing introductions in a much more personal way, or pairing off in bipartisan teams for short initial discussions, and then having participants report to the group by introducing their partner and his/her main concerns. The bottom line is that we created a novel social situation which called for openness, trust, and collaborative thinking, and the participants rose to the occasion. There was no partisan sniping and not a shred of hostility. People sometimes made points that supported the other side. Many on both sides expressed a desire to continue the conversation. Which we will do, in a way soon to be announced.